The DJI Phantom 3 � Hardshell Backpack is for Phantom 3 Advanced and Phantom 3 Professional, it�s waterproof to a certain extent. Specifications: Material: ABS (outside), EPP (inside). Color: Black. Net Weight: Approx. 1.61kg. Maximum Weight: 10kg. Buy this and you can Save $15 Off DJI Hardshell Backpack. With coupon code DJIBACKPACK15 at checkout. Save $60 Off DJI Phantom 3 Professional with 4K Camera. With coupon code DJIPRO60 at checkout. Shop Now. Save 50$ Off DJI OSMO Handheld 4K Camera and Gimbal. DJI X3 Digital Camcorder - Exmor R CMOS - 4K. The Osmo system from DJI combines the Zenmuse X3 camera/gimbal with a detachable handle, bringing the benefits of stabilized 4K shooting to a handheld form factor. The camera features a 1/2.3" CMOS sensor that enables up to full DCI 4K (4096 x 2160) video recording at 24 or 25p as well as 12MP photo capability. Basic controls for the camera and gimbal are provided on the handle itself, including a joystick for manual pan and tilt. For monitoring and more advanced operation, there is a Wi-Fi link allowing Osmo to be tethered to a mobile device running the DJI GO iOS and Android app. An included smartphone holder effectively turns your smartphone into an on-board monitor. The Wi-Fi features a range of up to 85', so you can operate the camera and gimbal remotely as well. An integrated microphone allows onboard audio recording. With advanced controls like audio gain settings, you can be sure you're not only getting the shot but also capturing the sound. A standard 3.5mm port is also available, so you can plug in your own microphone. Buy this Camcorder and you can Save $50 Off DJI OSMO Handheld 4K Camera and Gimbal with coupon code DJIOSMO50 at checkout. Dell H815dw Laser Multifunction Printer - Monochrome - Plain Paper Print - Desktop. Copier / Fax / Printer / Scanner - 40 ppm Mono Print - 1200 x 1200 dpi Print - 40 cpm Mono Copy - Support Recycled Paper, Pre. Office Machine Features: Print from USB flash drive, save to USB flash drive, scan to e-mail, scan to application, scan to network, scan to FTP, scan to SMB, Google Cloud Print 2.0. Buy this Printer and Save $15 Off Dell H815dw Multifunction Laser Printer with coupon code SAVEDELLH815 at checkout. Save $20 OFF on Order $200 3D Printing Accessories from pcrush.com. With coupon code 3DPSSAVE20 at checkout. Shop Now. Get 10% Off 3D ANY 3D PRINTER! Get 10% Off 3D ANY 3D PRINTER from pcrush.com. With coupon code 3DPSSAVE10 at checkout. Shop Now. Canon C3760N Laser Printer. Buy this and Save $15 Off Canon C3760N Laser Printer. With coupon code CANONLP15 at checkout. Canon imageCLASS LBP6780dn 42 ppm 600 x 600 dpi Monochrome Laser Printer. The imageCLASS LBP6780dn offers advanced features and high speeds to address the needs of small and medium businesses. With the large and expandable paper capacity, high yield replacement cartridge and high duty cycle offices can get more done without interruptions. The imageCLASS LBP6780dn produces black and white output at lightning fast speeds of up to 42 pages per minute with a Quick First Print time of less than 9 seconds. In addition to speed, the LBP6780dn offers easy to use features such as the 5-line LCD with animations, a front loading paper cassette and the Single Cartridge System. The LBP6780dn can handle up to 1,600 pages with the standard 500-sheet cassette, 100-sheet multipurpose tray and two optional 500-sheet cassettes allowing users to work throughout the day without interruptions. Businesses can lower their costs with the high-yield replacement cartridge, it yields up to 12,500 pages. Other cost saving features include automatic duplex printing and efficient energy saver mode, allowing offices to reduce paper consumption and lower energy costs. For users that are on-the-go, the imageCLASS LBP6780dn is compatible with the free Canon Mobile Printing app5 that allows users to print a variety of file types, web pages and images directly from their mobile device. Users can also take advantage of the Direct Print feature which allows users to print PDF, JPEG, TIFF and XPS files directly from a USB. So buy this Printer and you can Save $250 Off Canon imageCLASS LBP6780dn Laser Printer. With coupon code CANONIC250 at checkout. Save 10% Off Boytone Turntables! Save 10% Off Boytone Turntables from pcrush.com. With coupon code BOYTONE10 at checkout. Shop Now. Canon imageCLASS LBP6030W Laser Printer - Monochrome - 2400 x 600 dpi Print - Plain Paper Print - Desktop. The imageCLASS LBP6030w is a wireless, black and white laser printer that is a great fit for personal printing as well as small office and home office printing. The LBP6030w is easy to use and has a space-saving compact design that will fit right on a desktop. With quick first print speeds of less than 8 seconds the print will be at your fingertips fast with minimal waiting time. Additionally, the LBP6030w boasts print speeds of up to 19 pages per minute for multiple page output. To save on energy costs and lower energy consumption, the LBP6030w uses approximately 1.6 watts when in Energy Saver Mode. The LBP6030w is equipped with a 150-sheet front-loading paper cassette so replacing paper is simple and fast. With the Single Cartridge System that combines both toner and drum, you will only have one cartridge to replace. Canon GENUINE Toner was developed to deliver outstanding quality page after page. So buy this Printer and Save $30.00 Off For Canon imageCLASS LBP6030W Laser Printer - Summer Savings! Use Coupon Code T5G7F4S4R at check out! Canon imageCLASS LBP6780dn 42 ppm 600 x 600 dpi Monochrome Laser Printer. The imageCLASS LBP6780dn offers advanced features and high speeds to address the needs of small and medium businesses. With the large and expandable paper capacity, high yield replacement cartridge and high duty cycle offices can get more done without interruptions. The imageCLASS LBP6780dn produces black and white output at lightning fast speeds of up to 42 pages per minute with a Quick First Print time of less than 9 seconds. In addition to speed, the LBP6780dn offers easy to use features such as the 5-line LCD with animations, a front loading paper cassette and the Single Cartridge System. So buy this Printer and Save $220.00 Off for Canon imageCLASS LBP6780dn 42 ppm 600 x 600 dpi Monochrome Laser Printer Summer Savings! Use Coupon Code N5G6L3N7K at check out! Canon imageCLASS MF216n Laser Multifunction Printer - Monochrome - Plain Paper Print - Desktop. With the MF216n you can bring efficiency and productivity into your small or home office. All of your print, copy, scan and fax needs are combined into one easy to use device that delivers stellar output. The all new black and white touch panel is made to simplify navigation and also is customizable so you can access the most used features quickly and with ease. The convenience of networking through an Ethernet connection allows you to easily share printing, scanning and PC faxing. Documents will be at your fingertips in a flash with print speeds of up to 24 pages per minute and a Quick First Print time of 6 seconds or less. So buy this Printer and Save $30 Off For Canon imageCLASS MF216n Laser Multifunction Printer - Summer Savings! With Coupon Code Q4D6C3P3P at check out! Canon imageCLASS LBP7780Cdn 33 ppm 600 x 600 dpi Duplex Network Color Laser Printer. Produce vibrant color materials at blazing fast speeds with the Canon imageCLASS LBP7780Cdn. The LBP7780Cdn is equipped with a large and expandable paper capacity, automatic duplex printing, and high yield replacement cartridges which help to increase productivity while reducing costs. The LBP7780Cdn offers an array of cost and time saving features. The high-yield black replacement cartridge yields up to 12,000 pages while the replacement color cartridges yield approximately 6,400 pages. Other features such as automatic duplex printing and efficient energy saver mode contribute to lowering costs by helping to reduce paper consumption and lower energy costs. Increase office productivity with print speeds of up to 33 pages per minute in both color and black and white with a Quick First Print time of less than 10.5 seconds. So buy this Printer and Save an Additional $400 Off For Canon imageCLASS LBP7780Cdn 33 ppm 600 x 600 dpi Duplex Network Color Laser Printer - Summer Savings! Use Coupon Code O3B6Z3N2M at checkout! Canon imageCLASS MF8580CDW Laser Multifunction Printer - Color - Plain Paper Print - Desktop. Printer, Copier, Scanner, Fax - 21 ppm Mono/21 ppm Color Print - 2400 x 600 dpi Print - 21 cpm Mono/21 cpm Color Copy. The color imageCLASS MF8580Cdw ensures efficiency with its 4-in-1 functionality. With print, copy, scan and fax capabilities you can accomplish all necessary tasks with just one machine. With an array of easy to use features, such as the 7-line color LCD and Simple Solution Keys, your daily workflow will be a breeze. So buy this Printer and Save Additional $200 Off For Canon imageCLASS MF8580CDW Laser Multifunction Printer - Color - Plain Paper Print - Desktop Summer Savings! Use Coupon Code Z7M9L7Y6Y at checkout! Save 10$ OFF 100$ Order For First Time Buyers. Save $10 OFF $100 Order For First Time Buyers With Coupon Code O5G6M3O7K at pcRush.com. Shop Now. Lexmark MS510DN Laser 45 ppm 1200 x 1200 dpi Duplex Network Monochrome Laser Printer. 350 Sheet - Memory 256MB - Dual Core, 800 MHz - Duty Cycle 80000 pages/month - USB 2.0. The Lexmark MS510dn network-ready laser printer has internal 2-sided printing, an 800 MHz dual-core processor, 256MB of standard memory, 350-sheet standard input, a print speed of up to 45 ppm. So buy this Printer and Save $40 Off on Lexmark Mono Laser MS510dn. With Coupon Code: U7M8S5U9R at checkout. Lexmark MS415DN Laser Printer - Monochrome - 1200 x 1200 dpi Print - Plain Paper Print - Desktop. 40 ppm Mono Print - 300 sheets Input - Automatic Duplex Print - LCD - Gigabit Ethernet - USB. The Lexmark MS415dn combines a powerful processor, 256 MB of memory, 2.4-inch (6 cm) color display, eco-conscious features, and output at up to 40 pages per minute. Buy this Printer and Save $30 Off on Lexmark Mono Laser MS415dn. With Coupon Code: W7O9T6W1S at checkout. Canon imageCLASS LBP6780dn 42 ppm 600 x 600 dpi Monochrome Laser Printer. 42 ppm - 1600-page capacity - 100,000 Pages per month - Network Ready - USB Compatible - PC and MAC Compatible. The imageCLASS LBP6780dn offers advanced features and high speeds to address the needs of small and medium businesses. With the large and expandable paper capacity, high yield replacement cartridge and high duty cycle offices can get more done without interruptions. The imageCLASS LBP6780dn produces black and white output at lightning fast speeds of up to 42 pages per minute with a Quick First Print time of less than 9 seconds. In addition to speed, the LBP6780dn offers easy to use features such as the 5-line LCD with animations, a front loading paper cassette and the Single Cartridge System. For users that are on-the-go, the imageCLASS LBP6780dn is compatible with the free Canon Mobile Printing app5 that allows users to print a variety of file types, web pages and images directly from their mobile device. Users can also take advantage of the Direct Print feature which allows users to print PDF, JPEG, TIFF and XPS files directly from a USB. So buy this Printer and Save $220 Off on Canon imageCLASS LBP6780dn 42 ppm 600 x 600 dpi Monochrome Laser Printer With Coupon Code Q5I7O4Q8N at check out! Canon imageCLASS LBP7780Cdn 33 ppm 600 x 600 dpi Duplex Network Color Laser Printer. 33 ppm - 500 sheet input - 75,000 per month - Network ready - USB Compatible - PC Compatible - Mac Compatible. Produce vibrant color materials at blazing fast speeds with the Canon imageCLASS LBP7780Cdn. The LBP7780Cdn is equipped with a large and expandable paper capacity, automatic duplex printing, and high yield replacement cartridges which help to increase productivity while reducing costs. The LBP7780Cdn is compatible with the free Canon Mobile Printing app5 allowing users to print a variety of file types, web pages, and images directly from their mobile device. In addition to mobile printing capabilities, the LBP7780Cdn also features Direct Print, giving users the ability to print PDF, JPEG, TIFF and XPS files directly from a USB. So buy this Printer and Save Additional $500 Off for Canon imageCLASS LBP7780Cdn 33 ppm 600 x 600 dpi Duplex Network Color Laser Printer - With Coupon Code P5H7N3P8L at check out! Canon imageCLASS MF8580CDW Laser Multifunction Printer - Color - Plain Paper Print - Desktop. The Canon Color imageCLASS MF8580Cdw is loaded with easy to use features, outstanding color output and multifunction capabilities. The color imageCLASS MF8580Cdw ensures efficiency with its 4-in-1 functionality. With print, copy, scan and fax capabilities you can accomplish all necessary tasks with just one machine. With an array of easy to use features, such as the 7-line color LCD and Simple Solution Keys, your daily workflow will be a breeze. So buy this Printer and Save Additional $250 Off for Canon imageCLASS MF8580CDW Laser Multifunction Printer - Color - Plain Paper Print - Desktop - Use Coupon Code V7N9S5V1R at check out! Okidata MB760 LED Multifunction Printer - Monochrome - Plain Paper Print - Desktop, 5-Year Warranty. Copier, Fax, Scanner, Printer - 49 ppm Mono Print - 40 ipm Mono Print (ISO) - 1200 x 1200 dpi Print - 49 cpm Mono Copy. Buy this and Save $75 Off for Okidata MB760 LED Multifunction Printer - Monochrome - With Coupon Code O5G6M3O7L at checkout. Crisp, Clear Display for Hours of Immersive Entertainment. Brilliant, High-Resolution Display for Exceptional Detail. Ideal for reading, playing games, browsing the web, or watching movies, the Samsung Galaxy Tab 4 features a 7.0-inch, 1280x800 resolution screen, so you experience rich graphics, bright colors, and crisp text. The WatchON feature lets you type in your zip code and cable provider to browse and search current TV listings and get personalized recommendations based on your viewing history. Buy this Tablet and Save $22 Off for Galaxy Tab 4 (7-Inch, 8 GB, Black) - With Coupon Code U7M8R5U9Q at checkout. Save 25$ Off Galaxy Tab 4. Samsung Galaxy Tab 4 (10-Inch, 16 GB, White). Widescreen Display for Hours of Immersive Entertainment. Ideal for watching HD movies, playing games, browsing the web, or reading, the Samsung Galaxy Tab 4 features a 10.1-inch, 1280x800 resolution screen, so you experience rich graphics, bright colors, and crisp text. And buy this you can Save $25 Off for Galaxy Tab 4 (10-Inch, 16 GB, White). With Coupon Code I3A4G1I5F at checkout. Gigabyte GA-H97M-HD3 Desktop Motherboard - Intel H97 Express Chipset - Socket H3 LGA-1150. Micro ATX - 1 x Processor Support - 16 GB DDR3 SDRAM Maximum RAM - CrossFireX Support - Serial ATA/600 RAID Supported C. And buy this Gigabyte GA-H97M-HD3 Desktop Motherboard On Sale For $72.64 After $10 Mail-In Rebate + Free Ground Shipping! Gigabyte Ultra Durable GA-H97-D3H Desktop Motherboard For $90.23. Gigabyte Ultra Durable GA-H97-D3H Desktop Motherboard - Intel H97 Express Chipset - Socket H3 LGA-1150. GIGABYTE 9 Series motherboards support the latest 4th & 5th Generation Intel� Core� processors, bringing together a unique blend of features and technologies that offer the absolute ultimate platform for your next PC build. And buy this Gigabyte Ultra Durable GA-H97-D3H Desktop Motherboard On Sale For $90.23 After $15 Mail-In Rebate + Free Ground Shipping! Gigabyte Ultra Durable GA-Z97-HD3 Desktop Motherboard - Intel Z97 Express Chipset - Socket H3 LGA-1150. GIGABYTE 9 Series motherboards support the latest 4th & 5th Generation Intel� Core� processors, bringing together a unique blend of features and technologies that offer the absolute ultimate platform for your next PC build. And buy this Gigabyte Ultra Durable GA-Z97-HD3 Desktop Motherboard On Sale For $80.57 After $20 Mail-In Rebate + Free Ground Shipping! Gigabyte GA-970A-DS3P Desktop Motherboard - AMD 970 Chipset - Socket AM3+. ATX - 2 x Processor Support - 32 GB DDR3 SDRAM Maximum RAM - Serial ATA/600 RAID Supported Controller. And buy this Gigabyte GA-970A-DS3P Desktop Motherboard On Sale For $70.85 After $8 Mail-In Rebate + Free Ground Shipping! Gigabyte GA-F2A88XM-D3H Desktop Motherboard - AMD A88X Chipset - Socket FM2+. GIGABYTE FM2+ series motherboards based on AMD A88X chipset and feature the new FM2+ APU socket, and are designed to get the most from forthcoming Kaveri AMD APUs, while preserving compatibility for current AMD FM2 APUs. FM2+ AMD APUs offer native support for 8 GT/s PCI Express gen 3.0 as well as DX11.1 support integrating the high performance 'Steamroller' core. AMD socket FM2+ APUs also offer native support for 4K resolution displays on HDMI port. So buy this Gigabyte GA-F2A88XM-D3H Desktop Motherboard On Sale For $63.65 After $8 Mail-In Rebate + Free Ground Shipping! Gigabyte GA-B85M-D3H Desktop Motherboard - Intel B85 Express Chipset - Socket H3 LGA-1150 - Retail Pack. Micro ATX - 1 x Processor Support - 32 GB DDR3 SDRAM Maximum RAM - CrossFire Support - Serial ATA/600, Serial ATA/300. GIGABYTE 8 Series motherboards support the latest 4th Generation Intel� Core� processors, bringing together a unique blend of features and technologies that offer the absolute ultimate platform for your next PC build. From high current capable digital power delivery, performance-enhancing caching technologies, exclusive high-end audio features, advanced networking and device charging, gold plated hardware connectors and of course, killer good looks, GIGABYTE 8 series motherboards are in a class of their own. And buy this Gigabyte GA-B85M-D3H Desktop Motherboard On Sale For $77.23 After $8 Mail-In Rebate + Free Ground Shipping! Gigabyte Ultra Durable GA-H97M-D3H Desktop Motherboard - Intel H97 Express Chipset - Socket H3 LGA-1150. Micro ATX - 1 x Processor Support - 32 GB DDR3 SDRAM Maximum RAM - CrossFireX Support - Serial ATA/600 RAID Supported. And buy this Gigabyte Ultra Durable GA-H97M-D3H Desktop Motherboard On Sale for $83.27 After $10 Mail-In Rebate + Free Ground Shipping. HP Business V193 18.5" LED LCD Monitor. Get quality presentation features at a price point that doesn't break the bank with the HP V193 18.5-inch LED Backlit Monitor, a sleek, thin-profile monitor in a compact, space-saving screen size with an unbelievably low price point. Buy this HP Business V193 18.5" LED LCD Monitor On Sale For $79.99 After Coupon Code: X8P9V6X1T. Canon imageCLASS LBP6030W Laser Printer - Monochrome - 2400 x 600 dpi Print - Plain Paper Print - Desktop. The imageCLASS LBP6030w is a wireless, black and white laser printer that is a great fit for personal printing as well as small office and home office printing. The LBP6030w is easy to use and has a space-saving compact design that will fit right on a desktop. With quick first print speeds of less than 8 seconds the print will be at your fingertips fast with minimal waiting time. Additionally, the LBP6030w boasts print speeds of up to 19 pages per minute for multiple page output. To save on energy costs and lower energy consumption, the LBP6030w uses approximately 1.6 watts when in Energy Saver Mode. And buy this Canon imageCLASS LBP6030W Laser Printer - Monochrome - 2400 x 600 dpi Print - Plain Paper Print - Desktop On Sale For $44.95 Plus Free Ground Shipping! Canon imageCLASS MF216n Laser Multifunction Printer - Monochrome - Plain Paper Print - Desktop. With the MF216n you can bring efficiency and productivity into your small or home office. All of your print, copy, scan and fax needs are combined into one easy to use device that delivers stellar output. The all new black and white touch panel is made to simplify navigation and also is customizable so you can access the most used features quickly and with ease. The convenience of networking through an Ethernet connection allows you to easily share printing, scanning and PC faxing. Documents will be at your fingertips in a flash with print speeds of up to 24 pages per minute and a Quick First Print time of 6 seconds or less. So buy this imageCLASS MF216n Laser Multifunction Printer On Sale For $99.95 with Coupon Code CANONMF216 Plus Free Ground Shipping! Canon imageCLASS LBP7780Cdn 33 ppm 600 x 600 dpi Duplex Network Color Laser Printer. The LBP7780Cdn offers an array of cost and time saving features. The high-yield black replacement cartridge yields up to 12,000 pages while the replacement color cartridges yield approximately 6,400 pages. Other features such as automatic duplex printing and efficient energy saver mode contribute to lowering costs by helping to reduce paper consumption and lower energy costs. Increase office productivity with print speeds of up to 33 pages per minute in both color and black and white with a Quick First Print time of less than 10.5 seconds. So buy this imageCLASS LBP7780Cdn 33 ppm 600 x 600 dpi Duplex Network Color Laser Printer On Sale For $499.95 with Coupon Code CANON7780X2 Plus Free Ground Shipping! Canon imageCLASS LBP7660CDN Laser Printer - Color - 2400 x 600dpi Print - Plain Paper Print - Desktop. Create impactful marketing collateral, presentations and other critical business documents from the comfort of your own home or small office with the Canon Color imageCLASS LBP7660Cdn. Easy-to-use and compact, the device boasts print speeds of up to 21 pages-per-minute (ppm) in both color and black and white, and delivers Quick First Prints in approximately 15 seconds. It also offers a large paper handling of up to 250 pages in a front loading cassette and provides duplex output for printing professional-quality documents. Buy this imageCLASS LBP7660CDN Laser Printer - Color - 2400 x 600dpi Print - Plain Paper Print - Desktop On Sale For $199.95 with Coupon Code CANON7660X2 Plus Free Ground Shipping! Canon imageCLASS MF8280CW Laser Multifunction Printer - Color - Plain Paper Print - Desktop. The Canon Color imageCLASS MF8280Cw will simplify workflow and keep up with your mobile life. The imageCLASS MF8280Cw has 4-in-1 capabilities - you can print, copy, scan and fax all from the same machine. The MF8280Cw is also equipped with an array of mobile capabilities, easy-to-use features and superior imaging technologies. So buy this imageCLASS MF8280CW Laser Multifunction Printer - Color - Plain Paper Print - Desktop On Sale For $179.95 with Coupon Code CANON8280X2 Plus Free Ground Shipping! Canon imageCLASS MF8580CDW Laser Multifunction Printer - Color - Plain Paper Print - Desktop. The Canon Color imageCLASS MF8580Cdw is loaded with easy to use features, outstanding color output and multifunction capabilities. The color imageCLASS MF8580Cdw ensures efficiency with its 4-in-1 functionality. With print, copy, scan and fax capabilities you can accomplish all necessary tasks with just one machine. With an array of easy to use features, such as the 7-line color LCD and Simple Solution Keys, your daily workflow will be a breeze. Buy this imageCLASS MF8580CDW Laser Multifunction Printer - Color - Plain Paper Print - Desktop On Sale For $299.95 with Coupon Code CANON8580X6 Plus Free Ground Shipping! Canon imageCLASS D530 Laser Multifunction Printer - Monochrome - Plain Paper Print - Desktop. The imageCLASS D530 delivers on high quality copying, printing and scanning. Your small office or home office will experience excellence and reliability with the imageCLASS D530 multifunction copier. The D530 offers advanced copy, print and scan features that will fit perfectly with your business needs. Buy this imageCLASS D530 Laser Multifunction Printer - Monochrome - Plain Paper Print - Desktop On Sale For $79.95 with Coupon Code CANOND530X2 Plus Free Ground Shipping! The Visual Land Prestige 7L is the answer for those who want a feature driven Android Tablet at an affordable price. It is the perfect tablet for those who are new to the Android experience and are looking for that mobile solution to browsing the web, checking e-mails, video conferencing and more. The Prestige 7L is powered by the latest Android 4.1 Jelly Bean operating system. Whether you want to see the latest news, access your social networks, check the local weather or take gaming on the go, it's as simple as selecting an app and you're ready to go in seconds. The built-in WiFi allows you to connect to any wireless network and surf the web like never before. Zoom in and out of web pages, check and manage multiple e-mails at any time or even view stream video from wherever you are. The large 8GB internal storage gives you plenty of room for your apps and documents. A built-in, front-facing camera gives you the ability to make video calls. The super-thin and light weight design of the Prestige 7L makes it easy to fit it in a pocket or purse. You can even choose from a wide variety of colors to match your lifestyle. Buy this Visual Land Prestige 7L 8 GB Tablet - 7" - Wireless LAN - ARM Cortex A8 1 GHz - Blue On Sale For $47.66 + Free Ground Shipping at pcRUSH! Canon imageCLASS LBP6230dw Laser Printer - Monochrome - 2400 x 600 dpi Print - Plain Paper Print - Desktop. 26 ppm Mono Print - 251 sheets Input - Automatic Duplex Print - Fast Ethernet - Wireless LAN - USB. The LBP6230dw is a compact laser printer that delivers professional quality output at blazing fast speeds with impressive features including mobile printing, automatic 2-sided printing and wireless connectivity. It is also easy to use and is compact enough to fit right on a desktop for your personal, small office or home office needs. Buy this Canon imageCLASS LBP6230dw Laser Printer On Sale For $99.95 + Free Ground Shipping with Coupon Code CANON6230 at pcRUSH! Canon imageCLASS MF216n Laser Multifunction Printer - Monochrome - Plain Paper Print - Desktop. Copier/Printer/Scanner - 24 ppm Mono Print - 1200 x 1200 dpi Print - 24 cpm Mono Copy - Touchscreen LCD - 600 dpi Optic. With the MF216n you can bring efficiency and productivity into your small or home office. All of your print, copy, scan and fax needs are combined into one easy to use device that delivers stellar output. The all new black and white touch panel is made to simplify navigation and also is customizable so you can access the most used features quickly and with ease. The convenience of networking through an Ethernet connection allows you to easily share printing, scanning and PC faxing. Documents will be at your fingertips in a flash with print speeds of up to 24 pages per minute and a Quick First Print time of 6 seconds or less. So buy this Canon imageCLASS MF216n Laser Multifunction Printer On Sale For $99.95 + Free Ground Shipping with Coupon Code CANONMF216 at pcRUSH! Canon imageCLASS LBP7780Cdn 33 ppm 600 x 600 dpi Duplex Network Color Laser Printer. 33 ppm - 500 sheet input - 75,000 per month - Network ready - USB Compatible - PC Compatible - Mac Compatible. The LBP7780Cdn offers an array of cost and time saving features. The high-yield black replacement cartridge yields up to 12,000 pages while the replacement color cartridges yield approximately 6,400 pages. Other features such as automatic duplex printing and efficient energy saver mode contribute to lowering costs by helping to reduce paper consumption and lower energy costs. Increase office productivity with print speeds of up to 33 pages per minute1 in both color and black and white with a Quick First Print time of less than 10.5 seconds2. And buy this Canon imageCLASS LBP7780Cdn 33 ppm 600 x 600 dpi Duplex Network Color Laser Printer On Sale For $549.95 + Free Ground Shipping with Coupon Code CANON7780X4 at pcRUSH! Canon imageCLASS LBP7660CDN Laser Printer - Color - 2400 x 600dpi Print - Plain Paper Print - Desktop. Create impactful marketing collateral, presentations and other critical business documents from the comfort of your own home or small office with the Canon Color imageCLASS LBP7660Cdn. Easy-to-use and compact, the device boasts print speeds of up to 21 pages-per-minute (ppm) in both color and black and white, and delivers Quick First Prints in approximately 15 seconds. It also offers a large paper handling of up to 250 pages in a front loading cassette and provides duplex output for printing professional-quality documents. And buy this Canon imageCLASS LBP7660CDN Laser Printer - Color - 2400 x 600dpi Print - Plain Paper Print - Desktop On Sale For $199.95 + Free Ground Shipping with Coupon Code CANON7660X2 at pcRUSH! Canon imageCLASS MF8280CW Laser Multifunction Printer - Color - Plain Paper Print - Desktop. Printer, Copier, Scanner, Fax - 14 ppm Mono/14 ppm Color Print - 2400 x 600 dpi Print - 14 cpm Mono/14 cpm Color Copy L. The imageCLASS MF8280Cw has 4-in-1 capabilities - you can print, copy, scan and fax all from the same machine. The MF8280Cw is also equipped with an array of mobile capabilities, easy-to-use features and superior imaging technologies. So buy this Canon imageCLASS MF8280CW Laser Multifunction Printer - Color - Plain Paper Print - Desktop On Sale For $169.95 + Free Ground Shipping with Coupon Code CANON8280X2 at pcRUSH! Canon imageCLASS MF8580CDW Laser Multifunction Printer - Color - Plain Paper Print - Desktop. Printer, Copier, Scanner, Fax - 21 ppm Mono/21 ppm Color Print - 2400 x 600 dpi Print - 21 cpm Mono/21 cpm Color Copy L. The color imageCLASS MF8580Cdw ensures efficiency with its 4-in-1 functionality. With print, copy, scan and fax capabilities you can accomplish all necessary tasks with just one machine. With an array of easy to use features, such as the 7-line color LCD and Simple Solution Keys, your daily workflow will be a breeze. And buy this Canon imageCLASS MF8580CDW Laser Multifunction Printer - Color - Plain Paper Print - Desktop On Sale For $299.95 + Free Ground Shipping with Coupon Code CANON8580X6 at pcRUSH! Canon imageCLASS D530 Laser Multifunction Printer - Monochrome - Plain Paper Print - Desktop. Printer, Scanner, Copier - 26 ppm Mono Print - 1200 x 600 dpi Print - 26 cpm Mono Copy LCD - 600 dpi Optical Scan - Auto. Your small office or home office will experience excellence and reliability with the imageCLASS D530 multifunction copier. The D530 offers advanced copy, print and scan features that will fit perfectly with your business needs. The D530 offers eco-friendly copying options, including 2 on 1 and 4 on 1 - if you have 2 or 4 originals you can copy them onto 1 single page which helps to reduce paper usage. Another great copy feature is ID Card Copy which converts ID cards and other small two-sided originals to a one-sided document. So buy this Canon imageCLASS D530 Laser Multifunction Printer - Monochrome - Plain Paper Print - Desktop On Sale For $79.95 + Free Ground Shipping with Coupon Code CANOND530X2 at pcRUSH! Samsung Galaxy Note 10.1" Slate Tablet - 1.4 GHz 2GB 16GB Flash Memory Android 4.2 Jelly Bean - Deep Gray (Refurbished). 1280 x 800 WXGA Display - 2 GB RAM - Bluetooth - Front Camera/Webcam. Buy this Samsung Galaxy Note 10.1" Slate Tablet - 1.4 GHz 2GB 16GB Flash Memory Android 4.2 Jelly Bean - Deep Gray (Refurbished) On Sale For $228.35. Samsung Galaxy Note GT-N5110 8" Exynos 1.6GHz 2GB RAM 16GB Tablet Android 4.2 Jelly Bean - Brown/Black (Refurbished). Introducing the new Note 8.0, made for the thinkers, the dreamers, the movers and shakers. Scribble a thought, sketch out a concept, organize your ideas and express your creativity wherever inspiration may strike. It feels just right in your hand reading on the subway, giving a presentation, or enjoying a movie in bed. So buy this Samsung Galaxy Note GT-N5110 8" Exynos 1.6GHz 2GB RAM 16GB Tablet Android 4.2 Jelly Bean - Brown/Black (Refurbished) On Sale For $184.35 At pcRUSH While Supplies Last! Canon imageCLASS MF8280CW Laser Multifunction Printer - Color - Plain Paper Print - Desktop. Printer, Copier, Scanner, Fax - 14 ppm Mono/14 ppm Color Print - 2400 x 600 dpi Print - 14 cpm Mono/14 cpm Color Copy L. The imageCLASS MF8280Cw has 4-in-1 capabilities - you can print, copy, scan and fax all from the same machine. The MF8280Cw is also equipped with an array of mobile capabilities, easy-to-use features and superior imaging technologies. Buy this Printer and you can Save $250 Off on Canon imageCLASS MF8280CW Laser Multifunction Printer - Color - Plain Paper Print - Desktop with coupon code CANONMF8280. Canon imageCLASS LBP7660CDN Laser Printer - Color - 2400 x 600dpi Print - Plain Paper Print - Desktop. Create impactful marketing collateral, presentations and other critical business documents from the comfort of your own home or small office with the Canon Color imageCLASS LBP7660Cdn. Easy-to-use and compact, the device boasts print speeds of up to 21 pages-per-minute (ppm) in both color and black and white, and delivers Quick First Prints in approximately 15 seconds. It also offers a large paper handling of up to 250 pages in a front loading cassette and provides duplex output for printing professional-quality documents. Buy this Printer and you can Save $200 Off on the Canon imageCLASS LBP7660CDN Laser Printer - Color - 2400 x 600dpi Print - Plain Paper Print - Desktop with Coupon Code CANONLBP7660 Plus Free Ground Shipping. Canon imageCLASS LBP6780dn 42 ppm 600 x 600 dpi Monochrome Laser Printer. 42 ppm - 1600-page capacity - 100,000 Pages per month - Network Ready - USB Compatible - PC and MAC Compatible. The imageCLASS LBP6780dn offers advanced features and high speeds to address the needs of small and medium businesses. With the large and expandable paper capacity, high yield replacement cartridge and high duty cycle offices can get more done without interruptions. The imageCLASS LBP6780dn produces black and white output at lightning fast speeds of up to 42 pages per minute with a Quick First Print time of less than 9 seconds. In addition to speed, the LBP6780dn offers easy to use features such as the 5-line LCD with animations, a front loading paper cassette and the Single Cartridge System. The LBP6780dn can handle up to 1,600 pages with the standard 500-sheet cassette, 100-sheet multipurpose tray and two optional 500-sheet cassettes allowing users to work throughout the day without interruptions. Buy this Printer and you can Save $300 Off on the Canon imageCLASS LBP6780dn 42 ppm 600 x 600 dpi Monochrome Laser Printer with Coupon Code: CANONLBP6780. Plus Free Shipping. Canon imageCLASS MF4770n 24ppm 600 x 600 dpi Network Black & White Multifunction Laser Printer. Buy this Printer and you can Save $40 Off on the Canon imageCLASS MF4770n 24ppm 600 x 600 dpi Network Black & White Multifunction Laser Printer. With Coupon Code: CANON4470x2 at pcRush! Canon Imageclass D550 Mono Laser USB 2.0 1200 X 600 Multifunction Printer. Offering speed, convenience and reliability in a virtually maintenance-free and compact design, the imageCLASS D550 Black & White Laser Multifunction Copier is the perfect solution for any home or small office. Enhancing home and small office operation, Canon’s imageCLASS D550 provides all-mode duplex capabilities for printing, copying and scanning. With this duplexing capability, customers will be able to significantly reduce paper consumption by duplex printing documents from a PC. Through the device’s 50-sheet duplex automatic document feeder (DADF), output is easily duplex printed for a more streamlined office workflow. Buy this Printer and you can Save $50 Off on the Canon Imageclass D550 Mono Laser USB 2.0 1200 X 600 Multifunction Printer. With Coupon Code: CANOND550X2 at checkout. Canon imageCLASS D530 Laser Multifunction Printer - Monochrome - Plain Paper Print - Desktop. Printer, Scanner, Copier - 26 ppm Mono Print - 1200 x 600 dpi Print - 26 cpm Mono Copy LCD - 600 dpi Optical Scan - Auto. Your small office or home office will experience excellence and reliability with the imageCLASS D530 multifunction copier. The D530 offers advanced copy, print and scan features that will fit perfectly with your business needs. The D530 offers eco-friendly copying options, including 2 on 1 and 4 on 1 - if you have 2 or 4 originals you can copy them onto 1 single page which helps to reduce paper usage. Another great copy feature is ID Card Copy which converts ID cards and other small two-sided originals to a one-sided document. Buy this Printer and you can Save $50 on the Canon imageCLASS D530 Laser Multifunction Printer - Monochrome - Plain Paper Print - Desktop. With Coupon Code: CANOND530X2 at checkout. Canon imageCLASS MF4890DW Laser Multifunction Printer - Monochrome - Plain Paper Print - Desktop. Printer, Copier, Scanner, Fax - 26 ppm Mono Print - 1200 x 600 dpi Print - 26 cpm Mono Copy LCD - 600 dpi Optical Scan. High quality, versatility and ease of use make the imageCLASS MF4890dw the perfect choice for your home or small office. The MF4890dw offers advanced new features to add convenience to your work day, including the tiltable control panel, Quiet Mode11 and simple solution keys. With wireless capabilities9, speed and all mode duplex your home or small office will never miss a beat. So buy this Printer and you can Save $50 Off the Canon imageCLASS MF4890DW Laser Multifunction Printer - Monochrome - Plain Paper Print - Desktop. With Coupon Code: CANON4890X2 at checkout. Canon imageCLASS MF8580CDW Laser Multifunction Printer - Color - Plain Paper Print - Desktop. Printer, Copier, Scanner, Fax - 21 ppm Mono/21 ppm Color Print - 2400 x 600 dpi Print - 21 cpm Mono/21 cpm Color Copy L. The color imageCLASS MF8580Cdw ensures efficiency with its 4-in-1 functionality. With print, copy, scan and fax capabilities you can accomplish all necessary tasks with just one machine. With an array of easy to use features, such as the 7-line color LCD and Simple Solution Keys, your daily workflow will be a breeze. Buy this Printer and you can Save $150 Off on the Canon imageCLASS MF8580CDW Laser Multifunction Printer - Color - Plain Paper Print - Desktop. With Coupon Code: CANON8580X3 at checkout. Save 10$ on Acer ICONIA 16 GB Tablet - 8". Acer ICONIA A1-810-81251G01nG 16 GB Tablet - 8" - MediaTek MT8125T 1.20 GHz. The Iconia A Series delivers ultra mobility with no-compromise performance for your daily adventures. These tablets run fast and smooth, pairing the tablet-tailored Android™ operating system with potent processors. Plus, you can choose your kind of tablet experience: essential work and fun, extended battery life, or premium. So buy this Tablet and Save $10 on the Acer ICONIA A1-810-81251G01nG 16 GB Tablet - 8" - MediaTek MT8125T 1.20 GHz with Coupon Code ACERICONIAA1 Plus Free Ground Shipping. Save 10$ on Acer ICONIA 16 GB Tablet - 7" White. Acer ICONIA B1-710-83171G01nw 16 GB Tablet - 7" - MediaTek 1.20 GHz - White. Whether you're waiting for the train, sitting on the bus or relaxing in the coffee shop, the Iconia B Series makes each moment better. It's easy to hold in one hand and feels snug in your palm. About the same size as a paperback book, the 7" screen is ideal for reading. The Iconia B Series makes the journey as rewarding as the destination. At just 7" and about 320 grams, this tablet is small enough to slip easily into your commuting bag, yet big enough to provide a fine view of your favorite media. Read ebooks and magazines, watch videos, play games -- and enjoy every moment! Buy this Tablet and Save $10 on the Acer ICONIA B1-710-83171G01nw 16 GB Tablet - 7" - MediaTek 1.20 GHz - White with Coupon Code ACERICONIAB1 Plus Free Ground Shipping. Save 25$ on Lenovo IdeaTab Miix 2 64GB Tablet PC. Lenovo IdeaTab Miix 2 64GB Tablet PC - 8" - Intel - Silver. Lenovo Cloud Storage Protect your important files and data, while also making access to information and file-sharing quick and convenient. Automatically back-up and synchronize data across your home, while enabling access from multiple devices. Data is encrypted on transfer for an extra level of security. Buy this Tablet and you can Save $25 on the Lenovo IdeaTab Miix 2 64GB Tablet PC - 8" - Intel - Silver with Coupon Code LENOVOMIIX2 Plus Free Ground Shipping. ASUS MeMO Pad 8 (ME180A) features an LED-backlit display with a 1280 x 800 resolution and IPS (In-Plane Switching) technology for a bright and vibrant image, with wide viewing angles and great daylight visibility. High-quality dual speakers with ASUS SonicMaster audio technology give great sound quality, too. MeMO Pad 10 features a 2-megapixel rear camera. This model also captures 720p HD video and has a 1.2-megapixel front camera for video chat. So buy this Tablet and you can Save $20 on the Asus Asus MeMO Pad ME180A-A1-WH 8.0 inch 1.6GHz/ 1GB DDR3L/ 16GB SSD/ Android 4.2 Jelly Bean Tablet (White) with Coupon Code ASUSMEMO180 Plus Free Ground Shipping. Save 10$ on HP Slate 7 Extreme 16GB Tablet. HP Slate 7 Extreme 16GB Tablet - 7" - NVIDIA - Tegra 4. So buy this Tablet and Save $10 on the HP Slate 7 Extreme 16GB Tablet - 7" - NVIDIA - Tegra 4 with Coupon Code HPSLATE4400 Plus Free Ground Shipping. Save 10$ Off HP Slate 7 Plus 4200 4200us 8GB Tablet. HP Slate 7 Plus 4200 4200us 8GB Tablet - 7" - NVIDIA - Tegra 3 1.3GHz. So buy this Tablet and you can Save $10 of the HP Slate 7 Plus 4200 4200us 8GB Tablet - 7" - NVIDIA - Tegra 3 1.3GHz with Coupon Code HPSLATE4200 Plus Free Ground Shipping. Save 10$ on HP LaserJet Pro P1606dn Laser Printer! HP LaserJet Pro P1606dn 26ppm 600dpi Laser Printer. Our LaserJet Pro P1606dn Printer is ready to work hard to help you get ahead. Enjoy professional laser-quality results, plus built-in Ethernet networking and automatic two-sided printing. Save paper with the automatic two-sided printing. Conserve energy with our Instant-on and Auto-On/Auto-Off technology. Waste less paper by printing only the content you want with the Smart Web Printing feature. So buy this Printer and you can Save $10 on the HP LaserJet Pro P1606dn 26ppm 600dpi Laser Printer with Coupon Code HPLJP1606. Plus Free Ground Shipping. HP OfficeJet Pro x576DW 70 ppm 1200 x 1200 dpi Duplex Network Wireless Color Inkjet Multi-Function Printer. So buy this HP OfficeJet Pro x576DW 70 ppm 1200 x 1200 dpi Duplex Network Wireless Color Inkjet Multi-Function Printer for $589.26 Plus Free Ground Shipping. HP LaserJet Pro P1606dn 26ppm 600dpi Laser Printer. Our LaserJet Pro P1606dn Printer is ready to work hard to help you get ahead. Enjoy professional laser-quality results, plus built-in Ethernet networking and automatic two-sided printing. So buy this HP LaserJet Pro P1606dn 26ppm 600dpi Laser Printer for $143.26 Plus Free Ground Shipping. HP Officejet Pro 8600 Plus N911G Inkjet Multifunction Printer - Color - Plain Paper Print - Desktop. Produce professional color for up to 50% lower cost per page than lasers accelerate productivity with apps on the large touchscreen, networking options & versatile e-all-in-one performance. Easily print from a mobile device with HP ePrint. And buy this HP Officejet Pro 8600 Plus N911G Inkjet Multifunction Printer - Color - Plain Paper Print - Desktop for $299.00 Plus Free Ground Shipping. Logitech MK520 Keyboard & Pointing Device Kit. A sleek keyboard-and-mouse combo that puts convenience and control comfortably at your fingertips. You can say goodbye to cords, delays, dropouts, and interference with Logitech Advanced 2.4 GHz connectivity. The mouse and keyboard are so energy efficient you just might forget they use batteries at all. With softly rounded keys, a full-size layout, and a palm rest, this keyboard treats your hands right. So buy this Logitech MK520 Keyboard & Pointing Device Kit for $52.68 Plus Free Ground Shipping. Save 200$ on Canon imageCLASS LBP7660CDN Laser Printer. Canon imageCLASS LBP7660CDN Laser Printer - Color - 2400 x 600dpi Print - Plain Paper Print - Desktop. Create impactful marketing collateral, presentations and other critical business documents from the comfort of your own home or small office with the Canon Color imageCLASS LBP7660Cdn. Easy-to-use and compact, the device boasts print speeds of up to 21 pages-per-minute (ppm) in both color and black and white, and delivers Quick First Prints in approximately 15 seconds. It also offers a large paper handling of up to 250 pages in a front loading cassette and provides duplex output for printing professional-quality documents. So buy this Printer and Save $200 on the Canon imageCLASS LBP7660CDN Laser Printer - Color - 2400 x 600dpi Print - Plain Paper Print - Desktop with Coupon Code CANONLBP7660 Plus Free Ground Shipping. Save 100$ on Canon imageCLASS MF4890DW Laser Multifunction Printer. Canon imageCLASS MF4890DW Laser Multifunction Printer - Monochrome - Plain Paper Print - Desktop. High quality, versatility and ease of use make the imageCLASS MF4890dw the perfect choice for your home or small office. The MF4890dw offers advanced new features to add convenience to your work day, including the tiltable control panel, Quiet Mode11 and simple solution keys. With wireless capabilities9, speed and all mode duplex your home or small office will never miss a beat. Get this Printer and Save $100 on the Canon imageCLASS MF4890DW Laser Multifunction Printer - Monochrome - Plain Paper Print - Desktop with Coupon Code CANONMF4890 Plus Free Ground Shipping. Save 150$ on Canon Imageclass D550 Mono Laser Multifunction Printer. Canon Imageclass D550 Mono Laser USB 2.0 1200 X 600 Multifunction Printer. Offering speed, convenience and reliability in a virtually maintenance-free and compact design, the imageCLASS D550 Black & White Laser Multifunction Copier is the perfect solution for any home or small office. Enhancing home and small office operation, Canon’s imageCLASS D550 provides all-mode duplex capabilities for printing, copying and scanning. With this duplexing capability, customers will be able to significantly reduce paper consumption by duplex printing documents from a PC. Through the device’s 50-sheet duplex automatic document feeder (DADF), output is easily duplex printed for a more streamlined office workflow. So buy this Printer and you can Save $150 on the Canon Imageclass D550 Mono Laser USB 2.0 1200 X 600 Multifunction Printer with Coupon Code CANOND550 Plus Free Ground Shipping. Save 300$ Off on Canon imageCLASS LBP6780dn Monochrome Laser Printer. Canon imageCLASS LBP6780dn 42 ppm 600 x 600 dpi Monochrome Laser Printer. The imageCLASS LBP6780dn offers advanced features and high speeds to address the needs of small and medium businesses. With the large and expandable paper capacity, high yield replacement cartridge and high duty cycle offices can get more done without interruptions. The imageCLASS LBP6780dn produces black and white output at lightning fast speeds of up to 42 pages per minute with a Quick First Print time of less than 9 seconds. In addition to speed, the LBP6780dn offers easy to use features such as the 5-line LCD with animations, a front loading paper cassette and the Single Cartridge System. So buy this Printer and you can Save $300 on the Canon imageCLASS LBP6780dn 42 ppm 600 x 600 dpi Monochrome Laser Printer with Coupon Code CANONLBP6780 Plus Free Shipping. Save $100 on Canon imageCLASS D530 Laser Multifunction Printer. Canon imageCLASS D530 Laser Multifunction Printer - Monochrome - Plain Paper Print - Desktop. Buy this Printer and Save $100 Off on the Canon imageCLASS D530 Laser Multifunction Printer - Monochrome - Plain Paper Print - Desktop with Coupon Code CANOND530. Plus Free Ground Shipping. Save 100$ on Canon imageCLASS MF8580CDW Laser Multifunction Printer. Canon imageCLASS MF8580CDW Laser Multifunction Printer - Color - Plain Paper Print - Desktop. The color imageCLASS MF8580Cdw ensures efficiency with its 4-in-1 functionality. With print, copy, scan and fax capabilities you can accomplish all necessary tasks with just one machine. With an array of easy to use features, such as the 7-line color LCD and Simple Solution Keys, your daily workflow will be a breeze. So buy this Printer and you can Save $100 Off on Canon imageCLASS MF8580CDW Laser Multifunction Printer - Color - Plain Paper Print - Desktop with Coupon Code CANON8580x2. Plus Free Ground Shipping. Save 40$ Off on Canon imageCLASS MF4770n Network Black & White Multifunction Laser Printer. Canon imageCLASS MF4770n 24ppm 600 x 600 dpi Network Black & White Multifunction Laser Printer. Buy this Printer and you can Save $40 Off on the Canon imageCLASS MF4770n 24ppm 600 x 600 dpi Network Black & White Multifunction Laser Printer with Coupon Code: CANON4470x2 Plus Free Groupon Shipping. 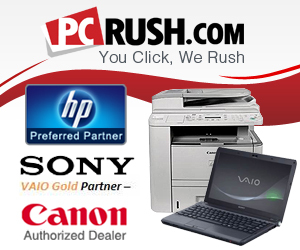 pcRUSH.com carries over 300,000 products from manufacturers such as HP, Cisco, Lenovo, Canon, Microsoft and hundreds more. We offer a complete selection of business and consumer products: Printers, Laptops, Tablets, All-in-Ones and Desktop computers, Switches and Routers, Scanners, Projectors, LCD TV & Monitors and so much more. pcRUSH.com maintains a 5 star customer service and satisfaction rating.